Your standard, run-of-the-mill blog design displays your main content on the left side with a sidebar that goes along the right side of your blog. But blogs designed using this layout can be anything but run-of-the-mill. 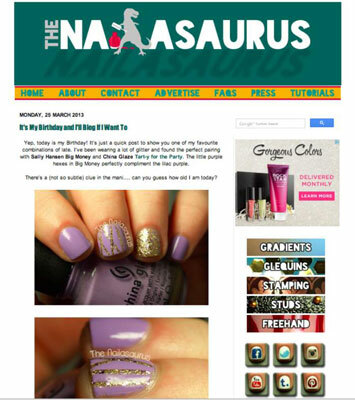 The Nailasaurus uses a two-column layout, drawing attention to the main post with a large photo that you see before you scroll down further into the blog post. The font in the navigation menu also exists in the sidebar, and the clever social media nail icons reinforce what this blog is about. Together, these design elements unify the blog header, sidebar, and main column. Western people read from left to right. Because English and most other languages move from left to right, this layout style makes your most important content (blog posts) the first thing someone sees to read. In fact, a study from the Nielsen Norman Group concluded that web users spend 69 percent of their time viewing the left side of the page. This layout is familiar to blog readers. Because this layout type is so popular, readers who frequently visit blogs are familiar with where to look for the blog post content and sidebar information. Of course, using a blog layout that so many others choose can also make your blog harder to stand out in a sea of blogs. In addition, while using only one sidebar usually makes a blog design less cluttered, you have to be more selective as to what content to feature. Split sections of your single sidebar into two parts if you need more space but don’t want to commit to two full sidebars.